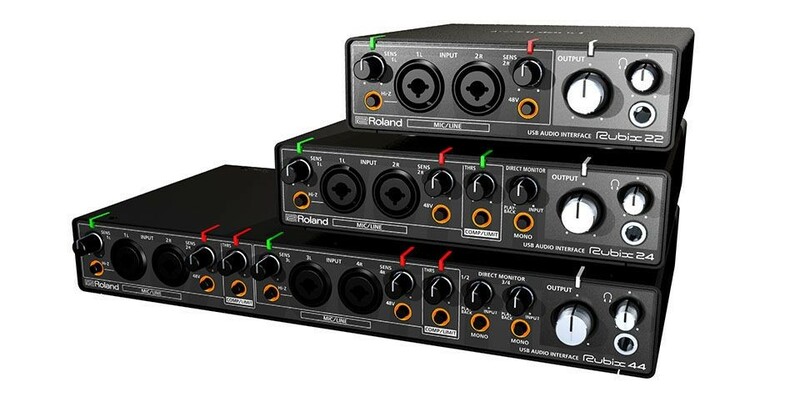 Roland have announced their new line of portable USB audio interfaces for Mac, PC and iPad. The Rubix line consists of 3 units – The Rubix 22, 24 and the 44 all of which are designed with transparent, low-noise pre-amps and support for audio resolutions up to 24-bit/192kHz. The Rubix 22 has 2 ins/2 outs, the 24 has 2 ins/4 outs and the 44 as you can probably guess has 4 ins/4 outs. All 3 interfaces also support MIDI I/O and feature combo jack inputs, Hi-Z inputs and headphones outputs. The 24 and 44 also feature a hardware compressor/limiter! A ground lift switch on the back should also help laptop users with ground loop issues. There’s a switchable power source on the 22 and 24 which allows you to power the interfaces with a USB battery when connecting them up to an iPad. The 44 does however require an AC adapter. The activity LEDs are visible from the front and the top of the units, making monitoring signal input from any angle very convenient . 2-in/2-out / 2-in/4-out / 4-in/4-out USB audio interface. 2 / 4 low-noise mic preamps with XLR combo jacks. Hardware compressor/limiter (Rubix 24 & Rubix 44). Hi-Z input for guitar and other high impedance sources. Easy-to-read indicators show vital information. Low latency, class compliant drivers. Ground lifts for quiet operation in a variety of venues. Info on pricing & availability yet to be confirmed. Previous PostIntroducing The Dark Blood Distortion Guitar Pedal by KHDKNext PostAudio Plug-in Subscriptions – Are they worth it?